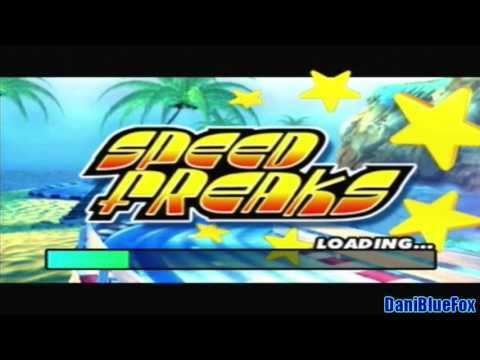 Speed punks which is also known as speed freaks in some places is an excellent cart racing game. Featureing six characters from the start you can unlock three more by completeing championships. In this racing game, no oppenent is your ally, the ai on this game can and will destroy you if your not careful. The characters may not look as they should but the game overall is fun. 12 tracks to race on one and two players. But racing three or four players, can only race on 12 other tracks that the game made so there won't be so much lag. This game is recommended for those who are aggresive, wanna go fast and slide around corners and blow other racers with bombs and other unique weapons you come across. This game also features a boost system that allows you to leave any oppenents in the dust. Back to ai description, they can use weapons and boost on this game. However, the track your on is choosing how hard they will go on you. For example, the very first track, you can easily lap them down and make perfect laps. But the very last track, you'll be lucky if you come out in one peice. This is a great game that everyone should try. Now you can add videos, screenshots, or other images (cover scans, disc scans, etc.) for Speed Punks [NTSC-U] to Emuparadise. Do it now!